This unique peaceful garden paradise feels worlds away, minutes from the famous black sands of Bethells Beach yet is only 30 minutes from Aucklands CBD. Welcome to our lodge Matuku Moana situated on the Bethells Road with the Matuku Link reserve across the road and the Forest and Bird sanctuary situated in the hills behind us. A unique setting of garden, forest and wetlands perfect accommodation for relaxation, adventure, or pampering as you enjoy a dip in the pool or a wine or two from a local vineyard. Try the unique experience of the Bethells Beach cafe on a Friday night. Lake Wainamu and Bethells Beach just a few minutes drive away, as well as being on the door step to many vineyards, breweries, and award winning restaurants in the Kumeu Valley and Riverhead regions (only 20 min away) The Waitakere golf course is only a short drive for golf enthusiasts. Matuku Moana Lodge is also a perfect location for wedding parties and guests being close to many wedding venues in the area including "Jonkers Farm". We are also a 3 min drive from Flaxmere house. If you would rather escape from it all then you do not have to leave the property. Watch the Tuis and Native Wood Pigeons perhaps catch a sighting of the Matuku Moana bird as she makes her way back to the coast, take a dip in the pool ,enjoy the craftsmanship and high timber ceilings of the beautiful Matuku Moana Lodge. The lodge can accommodate larger groups or small private events on per request basis. Pets ok by arrangement. Hi, John and I love hosting guests at our unique property and once family home. Matuku Moana was reinvented from our family home to guest accomodation when John and I became empty nesters a few years ago. John loves fishing and maintaining the Four hectare property surrounding Matuku Moana. I love painting, jazz music and spending time with my grandchildren. We love hosting and look forward to meeting you one day soon. 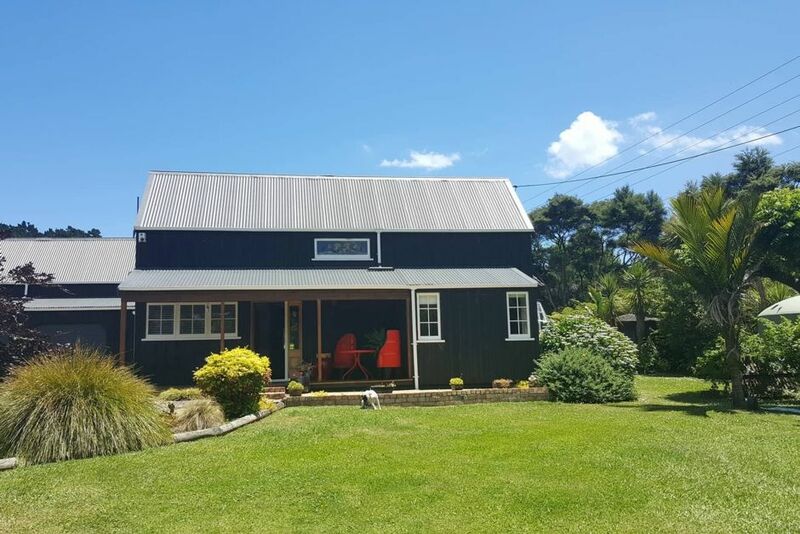 We have lived on our property for 35 years, once you experience life in the beautiful Waitakere ranges with the nearby beaches and easy going lifestyle, it is very hard to leave. Our children were all surf club members and we spent many hours at the beach and on the beautiful native bush tracks which are no closed sadly due to Kauri die back. However Lake Wainamu walking tracks are still open and the sight of Lake Wainamu is an experience for first time viewers. Matuku Moana was designed and built by architectural builder Kelvin Stace in the early 1980s. It has beautiful Douglas fir lined ceilings and beams and several stained glass windows, one inspired by a Don Binney painting of a bird flying over Lake Wainamu and Bethells Beach. During the summer months guests enjoy the pool area and we frequently have comments from guests about the feeling inside the home of peace and homliness. Two bathrooms both with showers and one also with bath. Our group of 8 stayed comfortably at the Matukumoana Lodge for a wedding at Jonkers Farm recently. We were warmly welcomed by both Rachel and John on the day we arrived and Rachel showed us around the grounds. Pity we didn't get the chance to dip into the pool. We enjoyed the convenience of the location as we were not far from Bethells Beach and Jonkers Farm. The Lodge is equipped with all the necessary utensils to cook meals. Awesome lodge! We enjoyed a lovely two night stay at Matuku Moana Lodge. We had four kids between us and they spent almost the entire time splashing about in the pool. The house was clean and spacious and very comfortable and accomodated children really well. The hosts were lovely to deal with also. Wonderful stay. The property had everything we could ask for and worked well for us with some friends and our baby. Nice attention to detail. A pleasure to stay in a well-loved well-looked after home.